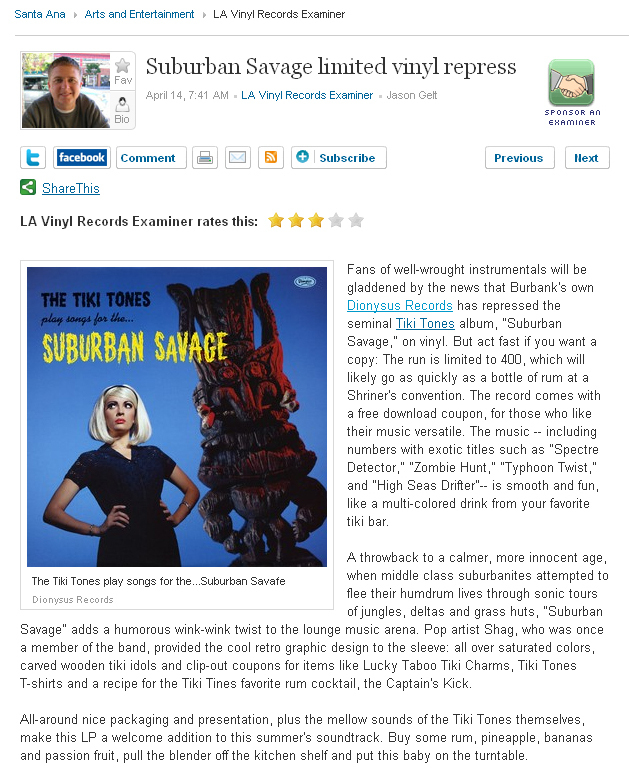 Jason Gelt of LA Examiner reviews the new Tiki Tones “Suburban Savage” LP repress on Dionysus. This limited repress of 400 comes from the original plates and comes with a free digital download coupon. The record is distributed (as is the entire Dionysus catalog) by Independent Label Coalition Distribution (ILC). Click this link to order directly from Dionysus Records. LA Artists Celebrate the Downtown Renaissance with an Ode to the Bohemian Event! $10 donation or $5 Bucks with recession story of 75-100 words, written prior or at the door or JERICO’S RECESSION CONFESSIONAL (brought to you by INSURGENCY INC), easy way to save a few bucks, step into the booth and tell us your hard luck story. Live Confessions will be featured at www.insurgencyinc.com following the event. This night honors “The Beat Generation,” who defined freedom of expression on so many levels. Taking themselves to higher states of conciseness using simple tools such as the American road, a glass of wine, caffeine and a typewriter; the new bohemians of their time broke ground for us. The typewriter is now a keyboard, but the beat still goes on — we are in the same circus with a different set of clowns. Since 1978, the artists of our time have come to Downtown Los Angeles with that same pioneer spirit, following the “low rent” dream. This is the artist family tree, growing and sinking its creative roots into the soil of Downtown Los Angeles. We gather to celebrate the Bohemian lifestyle in our Year of 2010 with an event that has its roots in 1940’s. This is rise of the Renaissance of Downtown Los Angeles that is at the core root about artists living the dream. Come celebrate this special time of magic centered in the “Last Great American City.” We are the Lost Angels, we have the Beat. This is an Event to Honor the Beat Generation of the 1940s, 1950s and early 1960s “Beatniks.” The Torch has been passed, and we keep it burning! Many words about the Bohemian culture describe what is happening now in Downtown LA. The Artists are moving to Downtown LA in numbers, just like SOHO in the past. Soho was a manufacturing zone transformed into an artist in residence situation, coining the term “LOFT” in historic manufacturing buildings. At the time, artists illegally lived in these large lofts, ignoring the zoning violations, and making use of the abandon and dormant space as a result of the bad economy in New York City. This is our situation here in DTLA now. The term “Bohemian” as related to Bohemianism – i.e. describing the nontraditional lifestyles of marginalized and impoverished artists, writers, musicians, and actors in major European cities – emerged in France in the early 19th century when artists and creators began to concentrate in the lower-rent, lower class gypsy neighborhoods. Since 1984 artist and screen-printer Lindsey Kuhn has been creating posters for rock shows worldwide. Credited with helping revive the lost art of the “rock poster,” Kuhn keeps the D.I.Y. ethic alive by continuing to print and sell his own work as well as the works and merchandise of other artists through his print company, SWAMP. “Lure of the SWAMP“ is Kuhn’s first book. Featuring 104 full-color pages with images of over 450 rock posters, “Lure of the SWAMP” chronicles 26 years of Lindsey’s printing history in images and text. The book has contributions from Kozik, Pushead, Ron Donovan, Tim Kerr, Michelle “Hell” Carr, Eric “Emo” Hartman, Stainboy and many others. Kuhn will make an appearance at La Luz to sign his book and will bring with him several of his rock posters; some new and some old, going back as far as the Jabberjaw days. In addition, Kuhn will bring several art prints, some originals and a few copies of the hardback version of “Lure of the SWAMP” along with a screen print laminated version of the book in a limited edition of 75 pieces. Other merchandise such as stickers and a toy or two will also be available.